These case examples have been developed based on real cases of abuse reported by professionals from the social care, health and banking sectors. 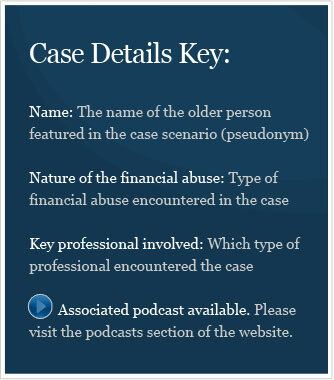 Each case features a specific professional, for instance a social worker, dealing with a different type of suspected financial abuse. The cases are labelled so that you can choose by the nature of financial abuse that occurred, for instance activities of rogue traders or a case involving misuse of lasting power of attorney authority.